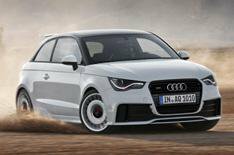 Audi A1 quattro unveiled | What Car? This is the Audi A1 quattro, a limited-edition, high-performance model with a 252bhp engine and four-wheel drive that will go on sale in the second half of 2012. The A1 quattros 2.0-litre turbocharged petrol engine has 70bhp more than the most powerful A1 currently on sale and is linked to a six-speed manual gearbox. The four-wheel-drive system sends most power to the front wheels, with drive sent to the rear wheels only if the front ones start to slip. Firmer front suspension and more sophisticated rear suspension are aimed at providing sharper handling. The A1 quattro will be available only in metallic Glacier White, with matching 18-inch alloy wheels. The roof is finished in high-gloss black trim, while bespoke bumpers, red headlight details and a large two-colour tailgate spoiler add to the aggressive makeover. Inside, there are leather sports seats with contrasting red trim, white instrument needles and lots of metallic trim. Standard equipment includes a Bose sound system, sat-nav, climate control and Bluetooth. Just 333 A1 quattros will be built and all will be left-hand-drive. Audi says a decision on whether a number will be imported to the UK will be taken in early January. Theres no word on prices, but wed expect the A1 quattro to cost around 25,000. Although the A1 quattro is a limited-edition model, Audi is expected to add an S1 model - with similar engine, chassis and cosmetic upgrades - to the range permanently in early 2013.